This blog post was originally published on the Community Catalyst Health Policy Hub on November 25, 2014. Dedicated advocacy has led to important successes in protecting health insurance coverage and health care access for people living with HIV. Below are three recent successes, both advocates working at the state and federal levels. Illinois – Successful Advocacy for Regulations to Protect Consumers from Industry Practices. AIDS Foundation of Chicago, AIDS Legal Council of Chicago and Jenner & Block recently drew attention to harmful and discriminatory health insurance industry practices of Illinois health insurers. In response to discriminatory practices they observed within qualified health plans in Illinois, they sent a complaint to the Illinois Department of Insurance including specific examples of coverage exclusions, burdensome prior authorization processes and other problematic practices. In response, the Department of Insurance issued a bulletin to insurers suggesting plans that fail to cover all HIV drugs as recommended by the Department of Health and Human Services (HHS) and plans who institute burdensome and redundant prior authorization requirements may be found to be discriminatory. Florida – Successful Advocacy for Lowered Cost-Sharing and Prices for Cigna Enrollees Living with HIV. The AIDS Institute and the National Health Law Program filed a complaint with HHS’s Office of Civil Rights regarding the discrimination practices that Cigna and three other Florida insurers implemented regarding HIV medications. These insurers placed all HIV medications, including generics, on specialty drug tiers. As a result, enrollees had to pay 40 percent – 50 percent of the cost of these medications, making them prohibitively expensive. Last month and in response to this complaint, Cigna entered into a consent order with Florida insurance regulators to agree to move generic HIV drugs to a lower-cost tier, limit copays to $200 a month for other HIV medications and to no longer require prior authorization for refills. The discrimination complaint is still under review by federal regulators. National – Successful Advocacy for a Federal Rule Requiring Insurers to Accept Payments from Ryan White. It is critical to continue advocacy efforts to end discriminatory practices that pose barriers to meaningful coverage for people living with HIV. This blog post was originally published on the Community Catalyst Health Policy Hub on November 24, 2014. Lack of Transparency: One of the goals of the Marketplaces was to permit consumers to compare health insurance plans and make an informed decision about which plan best covered their health care needs. However, failure to include cost information (such as the actual price of a medication when a consumer is expected to pay co-insurance), lack of standardization of plan formulary information, inadequate information on drug coverage and essential provider networks, inconsistencies between the Marketplace and plan websites, and changes to plan design subsequent to enrollment seriously undermine the ability of consumers to select the right plan for them. Recommendations for Advocates: Further legislation and regulations are needed to strengthen transparency at the state and federal level. For example, in Nevada, the Department of Insurance proposed a regulation to limit the ability of plans to reclassify drugs after the end of open enrollment. Consumers should also be educated on what kinds of information to ask for when selecting a plan, such as drug pricing and mail order pharmacy requirements. Inadequate Coverage of HIV Medications: Despite early advocacy efforts, many health insurance plans do not cover all HIV medications, including single tablet regimes (STRs), in accordance with the standard of care as recommended by the Department of Health and Human Services (HHS). In many states, plans are covering fewer protease inhibitors, the class of antiviral drugs widely used to treat HIV and hepatitis C, than required in the mandatory essential health benefits package (EHB) that plans offered on the exchanges are required to provide. In a recent assessment of the qualified health plans offered on 15 different health insurance Marketplaces, 28 percent of plans did not cover all HIV medications and 19 percent of plans did not cover STRs. The plans that do cover these medications may impose burdensome utilization review and prior authorization requirements, increasing the difficulty of accessing these medications for consumers. Recommendations for Advocates: To ensure consumers have access to adequate coverage of specialty drugs, an amendment to the EHB rule is needed to require coverage of specialty drugs where no generic alternatives exists that are widely accepted in treatment guidelines or best practices. In addition, HHS must strengthen the non-discrimination provisions of the ACA to protect people living with HIV/AIDS against formulary designs that do not serve their needs. Insurers should be educated about the health and cost benefits of STRs and consumers should be educated about the importance of checking plan formularies to make sure their required medications are covered. Unaffordable Cost-Sharing Structures: Many plans are placing all HIV medications on formulary tiers with very high levels of cost-sharing. According to Avalere’s recent analysis, 50 percent of HIV/AIDS drugs covered on plans offered through the exchanges and eligible for tax credits and subsidies are subject to an average of 36 percent co-insurance. The high levels of co-insurance required can make HIV medications prohibitively expensive for consumers, even with health insurance coverage. Adding to the cost burdens of individuals living with HIV/AIDS, health plans in North Dakota and Louisiana stopped accepting premium payments on behalf of their enrollees from Ryan White/AIDS Drug Assistance Programs (a special federal and state partnership program for individuals living with HIV/AIDS that can help individuals pay premiums and co-pays in some states). Continued Advocacy is Critical: What Can Advocates Do? Advocates can help mobilize provider groups and consumers to demand that insurers and regulations address individual consumer needs and end discriminatory practices that pose a barrier to meaningful coverage. Focus on consumer education during this upcoming open enrollment period: Consumers must be educated about a range of issues, including understanding terms like “co-insurance” and “deductible’ as well as checking plan formularies to make sure their required medications are covered. 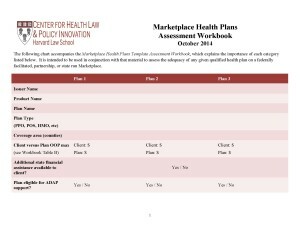 This plan assessment tool allows enrollment assisters to evaluate plans for their clients living with HIV and to empower advocates to monitor the Marketplaces for potential discrimination. Emphasis on consumer voices: When barriers to care—lack of transparency, inadequate coverage, or discriminatory cost sharing—are observed, advocates should consider filing complaints with state departments of insurance and demanding the enforcement of the non-discrimination protections in the ACA, which prohibit plans from employing discriminatory marketing practices and benefit designs or failing to meet EHB requirements. Advocates should also consider filing complaints with the Office of Civil Rights and to use the court system to put pressure on insurers to forgo discriminatory practices. While there is much work to be done, advocates in several states have successfully protected and secured access to health care coverage that does not discriminate against people with HIV/AIDS. Stay tuned for the next blog in this series to learn more. 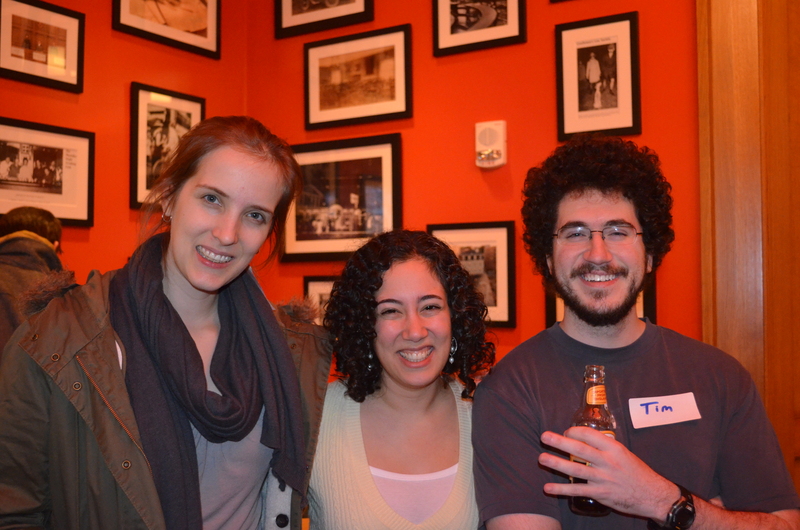 Applications for the 2014 Delta Fellowship will be accepted through February 6, 2015. This fellowship is a two-year commitment. Delta Directions: Who are we? The Delta Directions Consortium is an interdisciplinary group of individuals from academic institutions and foundations working towards change in the Mississippi Delta. Delta Directions believes that potential for progress and change in the Delta is so multifaceted and complex that its growth requires the interdisciplinary contributions of various professions, disciplines, and institutions. Delta Directions Consortium exists at the intersection of research and practice, providing a united front for coordinated and collaborative efforts for change within the Delta. Please see www.deltadirections.com for more information. The Delta Fellow: What do I do? The Delta Fellow works independently and as part of an interdisciplinary group of individuals from academic institutions, community-based organizations and foundations to create transformational change in the Mississippi Delta region by improving public health and promoting economic development. The Fellow designs new and innovative programs to address the poor health and economic outcomes in the region, assists in evaluating existing and proposed programs, researches, drafts, and edits comprehensive reports on selected issue areas, and advises on, evaluates and creates public policies that promotes positive change in the Delta. Food Policy: A previous Fellow helped to create and establish the Mississippi Food Policy Council (MFPC), the first of its kind in the state. With support and assistance from the Fellow, MFPC has come to be recognized by state legislators and organizations as the resource for guidance in food policy. The council releases reports, holds an annual conference, undertakes surveys and data, and has drafted and passed several significant pieces of state legislation around food policy. Farm to School: Working with the MFPC, Fellows have helped to bring the Farm to School movement to Mississippi. A previous Fellow, along with the Harvard Food Law and Policy Clinic, published comprehensive legal guides to Farm to School Purchasing and Selling and worked with schools to begin Farm to School programs. Fellows also assisted in the creation of an annual statewide Farm to Cafeteria Conference that is regularly attended by nearly 200 state stakeholders. Breastfeeding Awareness: A previous Fellow worked to increase breastfeeding rates in Mississippi through a multi-tiered outreach strategy. This included hosting community events across the Delta, working with local hospitals to establish breastfeeding-friendly practices, and promoting larger, systemic change through the successful drafting and passage of both local and state policy. Economic Development: Fellows have worked in various areas to improve economic development in Mississippi. A previous Fellow worked with University of Mississippi to create a small business incubator and a supportive transactional legal clinic for entrepreneurs in the state. Fellows have also drafted a number of reports in support of economic development, including a small business guide and recommendations for the state of Arkansas in developing a microfinance lending program. Early Childhood Education and Intervention: Previous Fellows have worked to increase Early Childhood Education in Mississippi through the drafting of several reports outlining the value of pre-K and early childhood education in Mississippi. A previous Fellow also secured funding and oversaw the implementation of a community parenting class, aimed at informing and supporting new parents with young children in the Delta. The Fellow’s principal responsibilities include: coordinating Delta Directions Consortium members with each other and with other institutions, including local partners, government entities, and nonprofit organization; providing human capital and support to local community-based organizations and projects; maintaining updated content on the Delta Directions website and Delta Directions blog, hosting periodic Delta Directions conferences, and identifying other ways to update Consortium members and community members about various Delta projects and increase general engagement with Delta Directions; planning and supervising research projects and programs for students interested in working on health and economic development in the Delta; developing, evaluating, advising on, and promoting supportive public policy within the Delta; fostering further collaboration among Harvard Law School and institutions working in the Delta; managing existing and developing new projects, based on local needs, resources, and recommendations and approval from the Delta Directions Advisory Board. 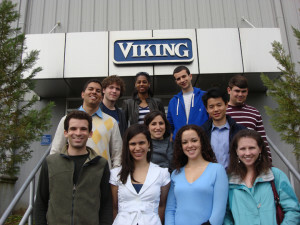 In addition to the above-mentioned issue areas and designated responsibilities, the fellowship provides the unique opportunity and freedom for Fellows to develop and pursue projects and other issues area of passion and interest. Assuming these issue areas and ideas match a need within the Delta, create positive and sustainable change, and are approved by the Delta Fellow Advisory Board, the Fellow is encouraged to seek out locally-based organizations and partners to collaborate with in order to launch programs and develop policies. The Fellow serves as Director of the Delta Directions Consortium as well as Harvard Law School Delta Clinical Fellow and Post-Doctoral Fellow at the Mississippi State University Social Science Research Center. The Fellowship is supported by the Winokur Family Foundation and Mississippi State University Social Science Research Center. The Fellow will report to the Director of Harvard Food Law and Policy Clinic at Harvard Law School and the Director of the Social Science Research Center at Mississippi State University, and will also provide regular oral and written progress reports to the Delta Directions Advisory Board. He/she will live and work in the Delta region and will also have an office at the Social Science Research Center at Mississippi State University, where the Fellow will travel regularly for meetings and updates. The Mississippi Delta consists of a number of counties on either side of the Missis­sippi River in Mississippi, Arkansas, and Louisiana, that used to be the alluvial floodplain for the river. This land, flat and fertile from years of Mississippi River flooding, created the unique agricultural heritage of the region. The Delta counties have many cultural and historical similarities, including the Delta’s claim to being the birthplace of the Blues. Nationally, the percent of individuals living below poverty is 14.5%. This rate is 22.3% in Mississippi. This rate is even higher in the Delta. Nationally, the median family household income in 2007 was $51,939. Mississippi ranks 50th in the U.S. with regard to household income, at $37,095, and even lower in the Delta. Nationally, the infant mortality rate is 6.27 per thousand births. The rate in Mississippi is over 9.86 per thousand, the highest in the nation. The rate is over 14 in some Mississippi Delta counties. Mississippi leads the United States in its obesity rate (35.1%), the rate of deaths resulting from cardiovascular disease (rates 30% above the national median), including heart disease and stroke death rate. Though these alarming statistics tell a grim story about the Delta, it is not the whole story. The Delta is also ready for change, and there is a large body of talented and committed people in the Delta anxious to make these changes. The work of Delta Directions, the Delta Fellow, and local partners present a unique opportunity for the region to renew itself as a thriving economic and social system, promoting its rich history and culture. The Delta Fellowship is an expected two-year commitment, subject to change or termination only in unusual circumstances. The Fellow is also expected to spend the first six months of the fellowship in residence at the Social Science Research Center at Mississippi State University in Starkville. The Fellow will based in the Delta for the remainder of the fellowship, with routine visits to the Social Science Research Center for various projects. $50,000 plus benefits per year with a relocation stipend, health benefits, and generous retirement benefits; also includes stipends/reimbursements for certain travel and other expenses related to the position. The Delta Fellow Selection Committee will include representatives from Harvard Law School and the Social Science Research Center at Mississippi State University, with input from the Winokur Family Foundation. Following receipt of the application materials, selected applicants will have a screening interview in Cambridge, and finalists will have the opportunity to travel to the Delta for interviews with community partners. For any questions related to the Delta Fellow Position or the application process, please contact Emily Broad Leib, ebroad@law.harvard.edu, 617-390-2590. The Center for Health Law and Policy Innovation is seeking several research assistants to work on a time-sensitive and critical analysis of health care policy implementation in private insurance markets and the health insurance exchanges. These positions are paid and will last until the New Year, with an option to extend. Work/study eligibility is not a requirement. Applicants should provide a resume/CV and a brief statement of interest and background, if any, in health care, health law or health policy. If interested please apply by email to Carmel Shachar at cshachar@law.harvard.edu. The Harvard Law School Center for Health Law and Policy Innovation (CHLPI) is seeking summer interns for its 2015 summer clinic semester in its Health Law and Policy Clinic and its Food Law and Policy Clinic. We are accepting applications on a rolling basis and will review applications starting in January 2015. The 2015 program will run from Tuesday, May 26th through Friday, July 31st for a minimum of 40 hours per week. We have some flexibility with regard to start and end dates as long as summer interns make at least an eight-week commitment. 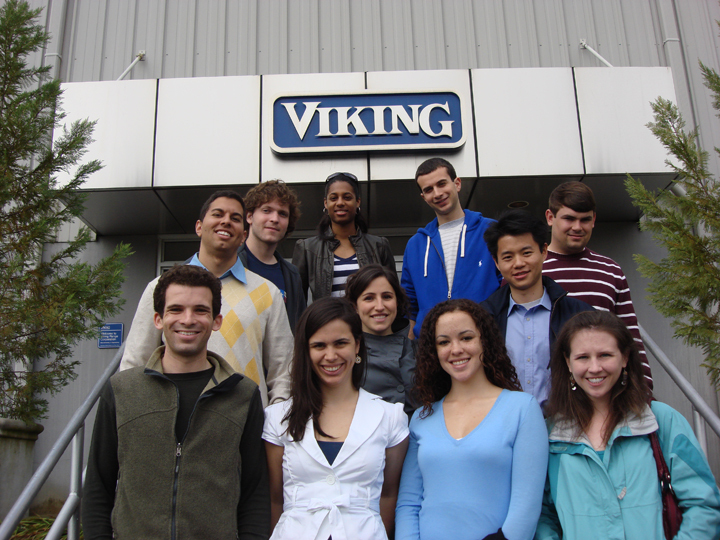 This internship program is primarily for law students. However, in previous summers we have taken other graduate and undergraduate students who show a keen interest and relevant experience in the field. Summer interns are unpaid. They are eligible for all public interest fellowships including law school summer public interest funding programs that may be available through their schools (these vary by school) and EJA. CHLPI program staff will support accepted candidates with whatever paperwork is needed from the sponsoring organization for these applications. The CHLPI summer internship program takes place in the CHLPI office located in the Jamaica Plain neighborhood of Boston. The Food Law and Policy Clinic (FLPC) aims to increase access to healthy foods, prevent diet-related diseases such as obesity and type 2 diabetes, and assist small and sustainable farmers and producers in breaking into new commercial food markets. Summer interns in the Food Law and Policy Clinic (FLPC) have the unique opportunity to engage in action-based learning to gain a deeper understanding of the complex challenges facing our current food system. Interns get hands-on experience conducting legal and policy research for individuals, community groups, and government agencies on a wide range of food law and policy issues, and are challenged to develop creative legal and policy solutions to pressing food issues, applying their knowledge from the law school classroom to real-world situations. Examples of project areas include providing policy guidance and advocacy trainings to state and local food policy councils, assessing how food safety regulations could be amended to increase economic opportunities for small local producers, recommending policies to increase access to healthy food for low-income communities, and identifying and breaking down legal barriers inhibiting small-scale and sustainable food production. FLPC interns have the opportunity to practice a number of valuable skills, including legal research and writing, drafting legislation and regulations, commenting on agency actions, public speaking and trainings, and community organizing, among others. Interns also have the opportunity to travel to meet with clients; for example, FLPC travels to work in places like Mississippi, Tennessee, Navajo Nation, and La Paz, Bolivia. The Health Law and Policy Clinic (HLPC) aims to improve the health of vulnerable populations, including low-income people living with HIV and AIDS, by expanding access to high-quality healthcare, reducing health disparities, supporting community education and advocacy capacity, and promoting legal, regulatory, and policy reforms that contribute to a more equitable individual and public health environment. Students will have the opportunity to develop cutting-edge policy recommendations at the state and national levels in both the legislative and regulatory arenas. Projects involve informing both national and state level implementation of the Affordable Care Act through regulatory comments and analysis, providing law and policy analysis to national and state coalitions advocating to protect the Medicaid program, and investigating best practices for initiatives to increase access to treatment and service programs serving vulnerable populations. Students gain a wealth of hands-on experience in current and emerging health law and policy issues, and develop written products such as fact sheets, in-depth reports, comment letters, testimony, presentations, and draft legislation or regulatory guidance. Students have the opportunity to develop a range of problem-solving, policy analysis, research and writing, oral communication, and leadership skills. Applicants interested in either the Health Law or Food Law and Policy Clinic should submit the following materials to chlpi@law.harvard.edu. Please indicate in your email to which clinic you are applying. If you are interested in both clinics, please rank them in order of preference. Open enrollment for Marketplace plans will begin November 15, 2014 and close February 15, 2015. For individuals living with one or more chronic conditions, selecting a health plan that provides affordable and adequate coverage is critical. CHLPI’s assessment tool is designed to assist individuals in identifying which plans offer the most appropriate coverage by focusing on elements such as provider networks, pharmaceutical formularies, out of pocket costs, and treatment limitations. 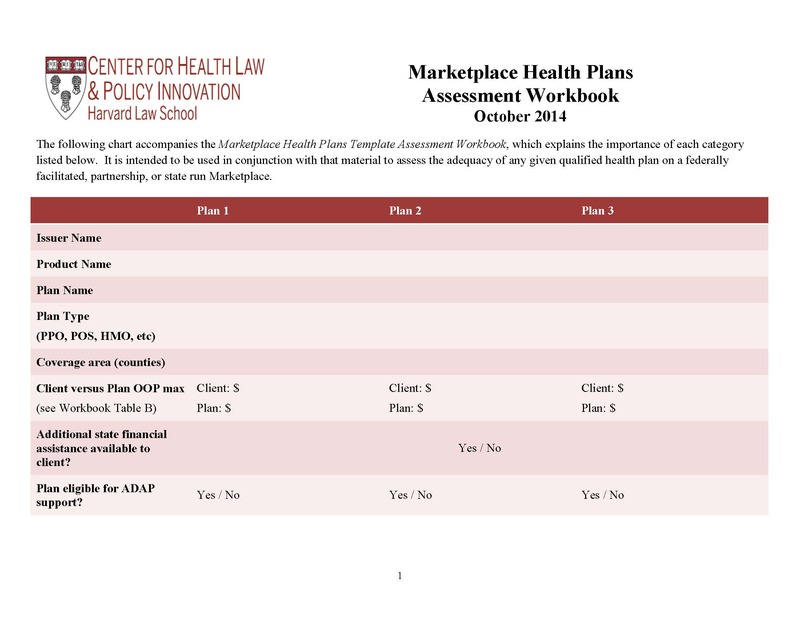 The assessment tool includes a workbook that walks users through health plan analysis step by step, and a worksheet that allows users to compare the advantages and disadvantages of several plans simultaneously. 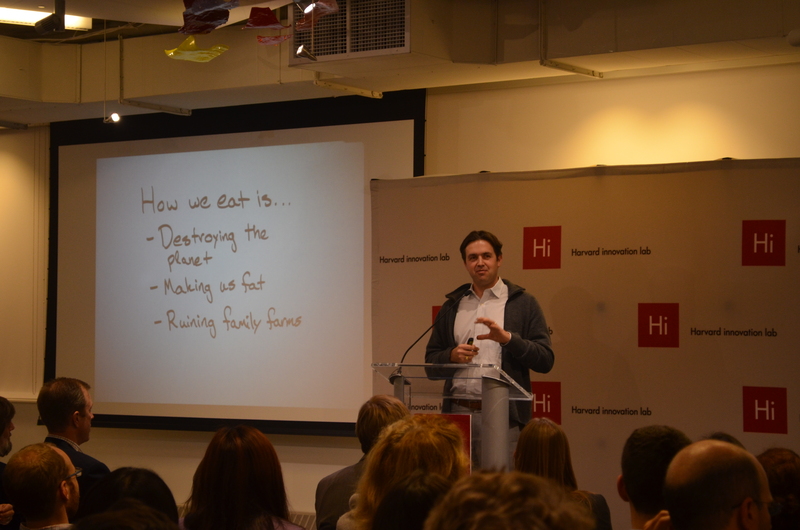 Deans’ Food System Challenge Successfully Kicked-off! Last week a group of Harvard Food Law and Policy Clinic and Food Law Seminar students crossed the river to join over 200 students and guests at the Harvard Business School for the launch of the Deans’ Food System Challenge. 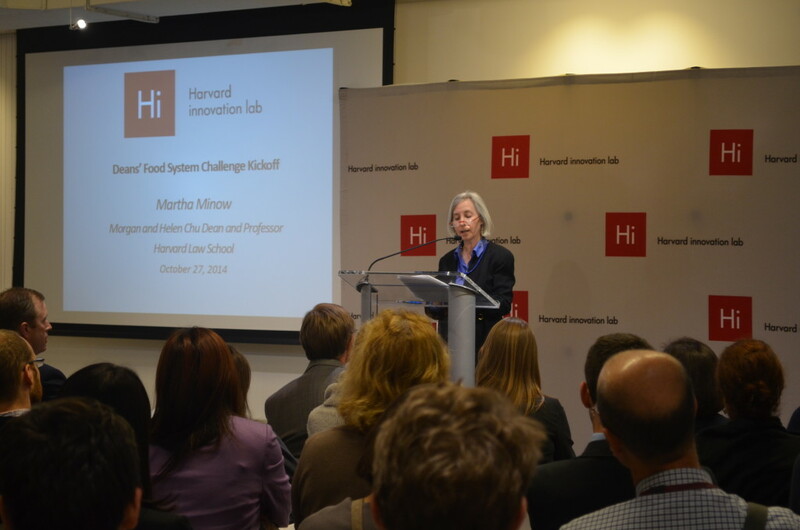 The Challenge, sponsored by Harvard Law School Dean Martha Minow and T.H. Chan School of Public Health Dean Julio Frenk is a year-long innovation competition where student teams develop venture proposals and are selected by a team of expert judges to be incubated at the Harvard i-Lab and receive financial prizes. Teams are challenged to develop innovative ideas to improve the health, social, and environmental outcomes of the food system. The i-Lab is the only space at Harvard not operating under the banner of any particular school. Instead, it is a space devoted to cross-collaboration between schools and between disciplines. If I’ve learned anything from my study of the food system while a Clinic student, it is that effective solutions will require dynamic approaches and new ways of thinking, incorporating legal, entrepreneurial, educational, and public health approaches. In that regard, the i-Lab is the perfect host for such a challenge. 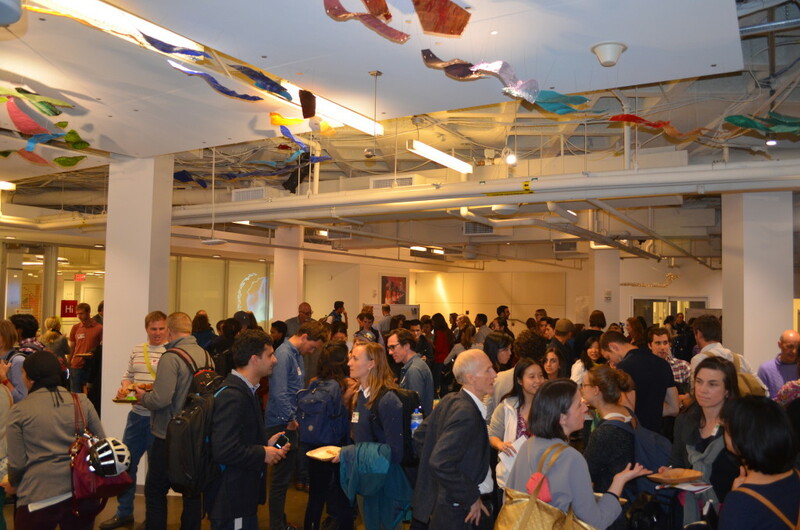 After a keynote speech by Ayr Muir, the founder of beloved Boston food start-up Clover Food Lab, attendees were let loose to mingle and make connections. We placed colored stickers on our nametags to signify whether we had an idea and sought collaborators, or the other way around. It initially felt a bit like a singles mixer, as people from different schools and backgrounds sought collaborators or pitched proposals. But after a few minutes the whole room was buzzing with people listening and sharing their ideas. After the Launch, my walk back into Cambridge flew by as my classmate and I chatted rapidly about our ideas and the encouragement and inspiration we had just received. If this launch was meant to start a conversation, I think it was a huge success.